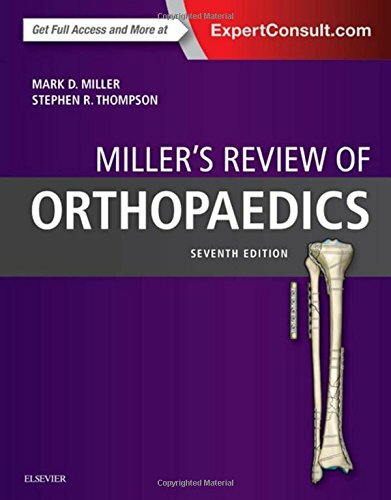 For nearly a quarter century Miller’s Review of Orthopaedics and the accompanying annual Miller Review Course (www.MillerReview.org) have been must-have resources that residents and practitioners have turned to for efficient and effective exam preparation. This 7th Edition continues to provide complete coverage of the field’s most-tested topics, now reorganized to be more intuitive, more user-friendly, and easier to read. Numerous study aids help you ace your exams: a superb art program, including full-color tables, images, and pathology slides; improved concise, bulleted text design; “testable facts” in every chapter; multiple-choice review questions written by experts in the field; and much more. Video clips and SAQs available online for easy access. Content and topic emphasis are fully aligned with the ABOS (American Board of Orthopaedic Surgery) and OITE (Orthopaedic In-Service Training Exam) exams, giving you the confidence you need to prepare for certification and recertification. Completely revised sections on anatomy, spine, and tumors, along with input from many new authors, keep you fully up to date. An increased emphasis on imaging, along with the most current results and techniques, ensure that you’re prepared for today’s exams. Includes new coverage of femoroacetabular impingement, spine trauma, common medications used in orthopaedics, and recent advances in basic sciences.